Lately, people have been talking about how ridiculous it is to have matrons and nurses monitoring housemen in wards. I agree with their sense of the absurd. But to be fair, let’s take a wait-and-see attitude before commenting further. This article is going to be my amateurish take of Maslow Hierarchy of Needs in relation to our housemen. I am no psychologist…have not had the opportunity to read much psychology as I am currently prioritizing psychopharmacology and psychopathology in my revision. I might be wrong but this is simply my way of looking at why things have become the way they are. This is a diagram showing Maslow Hierarchy of needs. It basically tells us that there are many levels of needs in each individual that motivate them to work. 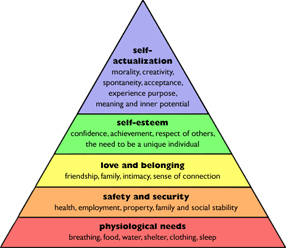 After one level is met, they will struggle to continue to achieve the next level of needs, climbing up the pyramid of needs to achieve the pinnacle of all needs. The pinnacle of all needs is termed as ‘self-actualization’. Once upon a time, most people went to work because they needed the money to meet their basic physiological needs. Not going to work meant not being able to pay for your basic physiological needs,namely the air (thank God that is free),food, water, shelter. Even within the same level, there are different priorities that need to be met. Someone who is struggling to breathe is not going to think about food. Imagine the life of a homeless person who does not have much worldly belongings beyond the clothes on his back, to begin with. Someone who cannot even ensure his or her next meal would not yet think that having shelter is that important (relatively speaking). Even procreation and reproduction (seen as important for continuation of species) is placed at the back burner. Really, finding love and a partner to share a homeless life with, is not important at this level. Being hungry is more urgent than having a home or a partner. Once you are able to ensure your basic physiological needs are consistently met (i.e, water and food; we can assume his airway, breathing and blood circulation are in working order), then you start to dream about having a small, tiny shelter. At this level of needs, you don’t care if you have any satisfaction at work. You don’t care about ideals and philosophy yet at this level. You don’t care about principles and would not know if you have one. Concepts like justice, fairness, gender equality, higher morality, fighting for the rights of others….they are just Utopian to you. You generally know those concepts are good ones, but you realize that mastering and internalizing those concepts cannot provide you with food once a day. So those concepts are just floating like pure white clouds up high in the sky…for wealthy rich people, higher in social status to talk about and concern themselves with. You couldn’t care less about those mumbo jumbo at this particular stage. Your boss can be a tyrant, your colleague can be a nuisance but you are always motivated to go to work because you are motivated by the most important of all needs; the basic physiological needs. You don’t care about feeling secure in your employment just yet. You don’t care if you are unfairly treated just yet. You don’t care if your male colleagues get paid more than yourself just yet. You are just grateful to be having this job! Have you ever heard our grandmothers and grandfathers suffered from depression? They might, for all we know. But they STILL performed their back-breaking intense labour with undying ardour (think rubber tapping, here. Not office work). My paternal grandparents were rubber tappers. They didn’t have the time to dwell on their feelings of dissatisfaction because continuing in labour means putting food on the table. In fact, I don’t think it ever occurred to them to be dissatisfied. Once, they tried to stop my father from continuing into his secondary school because they simply did not have the money. Education is not important when you are struggling to survive. But my father – thank God, I wouldn’t know where I would be, otherwise – persistently insisted to go to school. He was his school’s best student in SPM but he couldn’t continue his tertiary education because he had to go straight to work. He did go to university but he was only able to do that much, much later. I was already in my kindergarten by the time my father completed his diploma in Accountancy from ITM. I was 10 years old when my father finally graduated with a degree in Accountancy from UUM. I witnessed the sort of struggles my father had to go through being a mature part-time student and a weekend father. I witnessed my mother’s endurance in being a weekdays-single-parent. Looking back, it must be a difficult and hectic life for them at that time, I suppose…but it was a happy one. To the mind of a 10-years old child, they sure didn’t look depressed. This reminds me of a lecture given by Dr. MAZA once. Happiness and contentment cannot be determined by how difficult one’s life is. Happiness is a miracle bestowed to whoever Allah blesses. Someone who is homeless may sleep much better than those who reside in a mansion (how many people have come to PSY clinic complaining of poor sleep even if they have everything else they need. What would they give to be able to sleep a deep slumber like the weary, exhausted homeless people in the street! Being unable to sleep is one of the most frequent complaints in our clinic.) Sleep is a blessing bestowed on anyone Allah permits, and the affliction of having poor sleep does not distinguish where you are in your social status. It affects anyone rich and poor, if you are unlucky enough to get it. So, Allah is most fair in HIS blessings to HIS slaves. A difficult life in the eyes of others may be just as happy (if not more) where it matters most. Now fast forward a few decades…. Our housemen grew up in households whose mothers and fathers are much better at providing basic physiological needs. Their mothers and fathers work really hard to make sure that their own childhood deprivation will not be repeated onto their beloved children. Food, water, a nice home, and for some people, an annual vacation locally or abroad, are their childhood experience. Some housemen are offspring of other doctors who have always led an affluent life. Food, water, security in friendship and family ties…those are something they have always known all their lives and to a certain extent, taken for granted will always be theirs. They grew up reading a lot and have formed ideals in their head about how their lives are supposed to be. They don’t talk about getting their next meals….they talk about politics and humanitarian issues (I hope). They don’t talk about where to find shelter at night, they talk about philosophies and principles that used to be utopian to their grandparents and parents. Look again at the Maslow hierarchy of needs. At which level of needs do our housemen begin their working lives? We can already assume that they don’t start their working lives at the level of physiological needs. Most of them sure don’t start their working lives at the level of safety and belonging. At the very least, they start their working lives at the level of ‘esteem’. Pretty high up there in the pyramid! Believe me, some of my contemporaries and juniors (depending on how high they are in their family social status) start their working lives even at the highest level of ‘self-actualization’. They grew up being the best at everything and some were only ever been best students all their lives. They value morality, creativity, spontaneity (within the appropriate context). They value justice and their opinion being heard. They want to feel needed and they want to feel empowered. Having those values at the workplace would motivate them to go to work. Simply getting a salary at the end of the month is not going to cut it anymore. Some of the commentators were saying “Tolonglah jangan bekerja sebagai doktor kerana duit. Kerja sebagai doktor kerana you betul2 minat”. Come on…that comment is redundant, in my opinion. How many doctors of the previous generation really work as a doctor because they liked it? I have met many older generation who didn’t even specialize in the field they really like, yet they go on to become HOD some more. Perhaps, it is because the previous generation start their working lives at a different level in the pyramid? Or perhaps they too start their working lives at the higher level of pyramid…where their principles and esteem state that “Once started, I cannot quit”. I don’t know. But I am just saying that there are many complex reasons why housemen are termed ‘problematic’ these days. But as a PSY MO, I am not going to use the word ‘problematic. I am going to use the term ‘demotivated’. Now, you are telling your housemen of how bad they are at work. No doubt, some of them have poor attendance at work and mediocre performance during formal and informal assessment. Their attitude leave much to be desired. Some of our criticism are valid but some are exaggerated. We criticized them heavily for everything they did wrong. But we did not praise them for the things they did right. (Remember that they are starting their working lives at the ‘esteem’ level in the hierarchy of needs). If they presented their cases well, we did not comment on their improved performance…because we feel that it is what they are supposed to do, anyway. But when they forget the slightest thing, we scold them something fierce. I cannot help but think that our attitude towards them is not balanced. But remember where they are at the hierarchy of needs. Their motivation plummeted every time they are heavily scolded for the slightest thing while not getting any recognition for their improvement. Yes, this is not a school. This is simply life! But in life, we have to be fair. I believe in being fair. If I am going to scold you for every single thing you did wrong no matter how little, I am also going to praise you for every single thing you did right no matter how puny. But since I am quite stingy in my praises and recognition (I have a somewhat brusque manner and sometimes do not remember to praise people who have made my life easier at the workplace), I tried to be less particular about making my criticism known as long as the mistakes is not too glaring. If I feel that I can overlook those mistakes, I will overlook it or perhaps, gently admonish it. My lack of severe criticism is balanced by my lack of praises for them (not because I do not appreciate their work, but sometimes I forgot to acknowledge how helpful they are). I try to be more appreciative when I remember to do so. But overall, I am just not very demonstrative. But I think, I am pretty balanced. I don’t praise much but nor do I feel like scolding my subordinates all the time. Being fair in that manner creates good will in the working environment. Go ahead and scold them for every little thing. But ALSO go ahead and praise them for every little improvement. Otherwise, you should moderate BOTH your criticism and your praises. At least, your housemen know that they will be scolded today but will also be recognized tomorrow for their good work. And this will meet their needs for ‘esteem’ in their work place. Fast forward to the future where life is more luxurious than today…. One day, your school-children will grow up too. Your children too grow up in relative luxury if they are doctors’ children, trust me. I grew up when eating out at KFC was a treat. Heck, eating out ANYWHERE was a treat. But your children grow up having almost everything they could wish for if they are children of doctors. They too will start their working lives at the very high level of Maslow pyramid. Hopefully, your children will not be as ‘lazy’, as ‘bad’, as ‘irresponsible’ and as ‘manja-litis’ as these housemen. Some housemen are offspring of doctors. One of them might be yours one day. Some housemen who are offspring of doctors study in overseas…they come back to Malaysia and complained about the system now, and you tell them that they are ‘manja’. Your own offspring 10 years from now might have even HIGHER ideals about how things should be at work. Hopefully, they will not be labelled manja by their own bosses. Perhaps only then you will recognize that your children just want to meet different level of their needs compared to you. It is not their fault. It is just the way things are. You brought them up with the confidence that all their needs that are physiological, all their needs for safety and a sense of belonging are met. They took that for granted already. Now they want more. Once you have met one level of need, you will only care about meeting the next level. That is sunnahtullah…how things are. Human beings are created to be greedy for the betterment of what they already have. And in the case of housemen nowadays, the next level to be met is esteem and then, self actualization. Now our job as parents is to instil the right ‘esteem’ and the right ‘principles’. No matter how rich you are as a parent, give them chores at home. At least they should wash their own plates, make their own bed, wash their own clothes and sometimes take care of their younger siblings. Chores must be completed. They are trained to be accountable for what they are explicitly asked to do. Not completing the chores should warrant a punishment and their privileges should be taken away. And when you occasionally treat them to something nice, there should be a very compelling reason for you to do so. Some people do not agree about spanking children when they misbehave. Well…perhaps most psychiatrist would disagree with me when I said I would not discount the possibility of spanking them (within limit and reason) when it is warranted. But that’s just my personal opinion. Sometimes I believe that because my parents were so strict, I made it through housemanship. Even the scariest boss I had ever met had never scolded me any worse than my father had when I misbehaved. The only difference is that, with my father, I had the luxury and the satisfaction of answering back and stating my case, and thus my internal conflict is resolved right there and then. During my housemanship, I did not always answer back to every thing my boss said, but then, I wrote about it in my blog. So eventually, it evens out. Hahah. If you instill in them the principles and ideals of responsibility, they will go to work because they want to fulfill that responsibility. Because being responsible is ALREADY part of their ideals and their sense of esteem in the hierarchy of needs. But to to have that sense of responsibility as part of their ideals and sense of self…. that takes a lifetime of training. Giving chores at home is one of those training. Asking them to account for what they do is a training. Telling them repeatedly as they grow up that you have to complete what you started is a training starting from childhood. I grew up having an elder sister who is independent of my parents’s money since she was 18 years old (she was a famous novelist a decade ago…wrote three famous novels and earned a lot of royalty. She stopped writing after completing her PhD in statistics, mostly due to her hectic adult life. My sister and I share a deep passion for writing. The difference is in her case, she has been published and I am forever envious hahha). See? It was not physiological needs that motivate me, at the end of the day. It was not money, really. It was simply my ideal at that time that I should be independent of my parents. To be honest, four years ago, I started working at the level of ‘esteem’ in the Maslow pyramid. Parents must take back their assurance of “I will support your physiological needs if you quit housemanship.” Perhaps only then the housemen will be easily motivated to go to work. Forcing our housemen children to meet their own physiological needs is a higher motivating factor because it is the most basic. They would be less likely to be MIA if they know they could lose their job and thus, their means of survival. -But realistically, how many parents can do that? Can we tell our kids “I don’t care if you go hungry. Get out of the house. I am not going to shelter you. You are an adult now. Go earn your living.” Seriously? Sampai hati kah? – Unfortunately, this may not be realistic for loving parents out there. -Unfortunately, my dear housemen, this is not realistic either. It takes a lot of work and years of persistent advocacy to create what you feel is an ideal working environment. This is an ongoing job and your being MIA is not helping the cause. That is why you have to continue your housemanship. So that when you become a specialist, you can create that environment. To quote Mahatma Ghandi: “First they ignore you, then the laugh at you, then they fight you, then you win”. Envision that in your mind, and go to work every day. – It is sunnahtullah that the older generation will be leaving sooner or later. It is sunahtullah that our time will come to set the agenda. But remember that it is also sunnahtullah that your junior might not agree with you later. No hard feelings…no offense…that’s just how things are. Just make sure you remember how you were when you were young….so that you will try to meet your juniors half way. Housemen to tough it out, be an MO, and later, be a specialist and then advocate your ideals more forcefully. -This is the most realistic option. It is in NO WAY refuting your feelings of how bad our system is. I am not saying your complaints are all invalid (some of them are valid, some are really a case of ‘manjalitis’ and some are just plain rubbish). -I am saying, do not quit yet… but work for your ideals from now. -Remember that you do not work for whichever boss you despise. You go to work because you want to be a functional member of the society who contribute to the well-being of others. It is part of fulfilling your esteem and your self-standard in who you are as a person. If that means you have to take craps from some people for two years, just do it. It will be better, later. Trust me. – Once you have obtained the position of a specialist, you will be in a much better position to sway your circle of influence. The reward will be sweet. – Do not make rash decision to quit when you are under stress. Stress trigger your fight-or-flight reaction. In situations like that, you do not use your prefrontal cortex in making decision. Not much higher level thinking is involved in making rash decisions under duress. Instead, your amygdala takes over, asking you to simply react (in the mistaken belief that you are in danger and trying to prompt you to run), and thus stupid decisions are made at times like this; decisions that you would not normally make when you are relaxed and thinking clearly. -Of course housemanship itself is stressful. But if you tough it out, you will learn to force yourself to use your prefrontal cortex to think clearly even when you are in stress. You will master the art of thinking clearly on your feet, at the spur of the moment while being attacked with questions or insinuations of incompetence by your specialist and your MOs (and perhaps the matron and the nurses too, since they are said to be monitoring you soon. Gosh, I feel so sorry for you guys). Practice makes perfect, after all. Imagine 2 years of being able to force down your amygdala to rise to the usage of higher prefrontal cortex during stress when other ‘normal non-doctors human beings’ would already turn tail and run! That is something to be proud of, you know. -On the part of the administration, we should go through the procedure of ‘tindakan tatatertib’ if all other options are exhausted. We understand how reward-punishment method works. If all fails, this should be implemented to the letter. -Being serious in punishing MIA housemen can bring back the sense of urgency for housemen to do well in their housemanship. In a way, we are threatening them with loss of employment. If they still don’t care enough to come to work afterwards, then perhaps they do not need their jobs after all, and their employment should be terminated. Once you deliver the warning, you have to follow it through. Perhaps, this is the ONLY way to revive their sense of commitments. Below are some of the quotes by Abraham Maslow that I find quite illuminating in its wittiness. At the very least, they are very entertaining. I certainly enjoyed reading them and I hope you do too. “You will either step forward into growth, or step backward into safety”. (This one quote should resonate in all of us. Nothing is static. There are only two options: forward or backward. You choose). Remember to stay motivated, folks. Until next time, insya Allah. Hi. I am one of those HOs who are currently MIA. I never thought I would do this as I have always been a disciplined person before. I wish everything would go smooth-sailing, but no. I hate my MOs and specialists, up to the HOD. I feel murderous and I always imagine stabbing them at the back with the sharpest of knives. I wish the most rude MO in the department would get run by a truck on the way to work in the morning. I am a 3rd poster and in my first 2 postings, my superiors have been inspiring and supportive. Unlike this department, my superiors are arrogant head to toe. I love my job. I actually enjoyed my job during the first 2 postings but yes, I decided to quit out of anger and frustrations after being attacked by MOs and made silly mistakes. I lost my confidence. It has been 5 months since I MIA,and I miss my job. It’s just that I hate those rude people. I wish they could die instantaneously out of Ebola infestation to the whole department or something, so they would be replaced with good people who could make the world more peaceful. No, that’s just too good to be true. I actually have dysthymia and due to this, suffered acute stress reaction – insomnia, changing appetite, anhedonic, fatigue. Are you a Psy MO? Do you have any suggestions on how to improve self-esteem, especially for a dysthymic HO? Sorry for this late reply as I am quite heavily occupied these days. If this is what you have been feeling, I suggest you to seek out professional help. I can give you suggestions but to do so without really having a proper history and a proper context of your situation would not be fair to you and it won’t be just. It would not satisfy you. Please take some time to talk to someone and perhaps start on medication if appropriate. I wish you all the best. done it….so fluid. Salam hormat Dr. I had to know Maslow Hierarchy of Needs as part of my practice too. I am glad you think this is good enough. It really is amateurish by a specialist standard.